The most effective, Non-HVAC, dry vapor, high-performance, Bluetooth-operated scent-diffusing unit for branding any large commercial space. Set the mood, freshen the air and control odors, so every impression is as lasting as it should be. The patented AromaBeam™ dry vapor fragrance diffuser system effectively freshens interior spaces of up to 50,000 cubic feet, and is perfect for controlled scent marketing of retail environments, hotels or motels, healthcare facilities or medical centers, restaurants, spas or fitness centers, office buildings, schools, nursing homes, churches, day care centers and more. The AromaBeam™ method is non-nebulizing (without wet vapor) and easily controlled through our Scent Bridge smart phone app for Android and iOS. There are no messy liquids or sprays and no complicated timers to set. The Aroma Beam is one of the most effective ways for business owners to evoke positive responses with clients, customers and consumers in larger environments. Scentsia Fragrance Cartridges: Delicately traced dry vapor Scentsia fragrance formulations are developed specifically for experiential scenting in large spaces. Options include: Cinnamon Buns, Coconut Lemongrass, Coffee, Fresh Breeze, Island Breeze, Lavender, Apples & Oak, Lemongrass & Sage, Ocean Breeze, Passion Fruit & Melon, Sensational, Sweet Comfort, White Tea, Citrus, Fresh Mint, Neutral and Smoke End. We also offer an odorless, Fragrance-Free option utilizing our Metazene additive for superior, large area odor control without aroma enhancement. The AromaBeam™ Scentsia Cartridge holds a full 30 days worth of pure fragrance specially formulated to kindle just the right response depending on your application. Choose from dozens of aromas or opt for our premium service and create a custom scent. The AromaBeam™ Squair™ Solids offer the availability to mix and match from a variety of aromas to style your own custom scent. 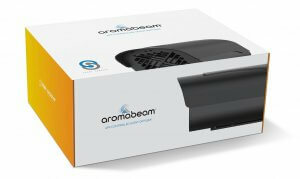 Each AromaBeam™ diffuser holds ten Squair solid refills and has up to 30-day fully adjustable performance! Why Is The AromaBeam The Best Large Room Air Freshener? Mobile-controlled APP enabling daily, hourly and monthly control from your mobile device – Scent Bridge. How Can Scent Marketing Improve Your Business’ Bottom Line? We recently wrote about the statistics behind scent marketing and how it’s increasing the bottom lines of businesses across every industry under the sun, but to boil down the science, 75% of all of the emotions we experience are generated by the smells we encounter. The olfactory system is how our brain associates aromas with our surroundings. Attached to our limbic system, it immediately creates impressions and recalls memories, subtly inspiring the moods of patrons, customers and consumers. As a result, scent marketing has become a proven and impactful way of connecting to customers. But what does this mean as it relates to your customers? Well, how often do you hear someone reminiscing about the mouthwatering aroma of grandma’s homemade apple crisp gently wafting from the kitchen and into the living room on a chilly fall evening? This aroma invokes very strong emotions not only of the aroma itself, but of the people, atmosphere, and other objects associated with it. For the same reasons, this is why scent marketing is vital to ensuring the success of a business or a brand. By carefully crafting impactful fragrances for business, our systems can invoke the moods, invigorate their senses and build strong emotional connections with your customers. How do you create brand awareness through Scent Marketing? Studies have shown that 83% of all commercial communication and advertising is designed to appeal only to our visual senses. Air-Scent International has a program utilizing our proprietary diffusion systems that incorporates decades of experience from our fragrance designers. With this, you can deploy our luxury line of fragrances in effective locations for any commercial interior space. Whether you are enhancing an apartment, hotel or hospitality brand, fitness center, senior care home or retail store, the opportunities are endless. Our fragrance development team have designed an effective line of fragrances to invoke a positive emotional response for any brand. Call us today to learn how a Scent Marketing program can enhance your service companies bottom line. For well over seven decades, our perfumers have been creating unique aroma blends for businesses, both large and small, throughout the world. Choose from our array of proven, curated scents, or as a premium service, we’re uniquely equipped to create an original scent for your brand through our in-house fragrance division. If the inner entrepreneur is stirring within you, or you’re currently an air care distributor or route service operator, representing our air freshener products is the perfect home-based business opportunity. Learn more about starting your own air freshener business with our air care products, services, and support. Repetitive service routes such as janitorial, maid and restroom hygiene cleaning services, vending companies, pest control services, textile and garment rental (TRS) are perfectly suited for our add-on services. If you operate a route service business, our air freshening products are the perfect add-on to increase your monthly income. Installation and service are fast and easy, and there is unlimited potential for customers.